Home > Tools & Techniques > Could Better Nutrition Help Your Child Learn to Read? It's a well-known fact that it's tough to focus on learning anything if you have an empty stomach… but what if your belly is filled with food that has little to no nutritional value? For many parents, meals have become somewhat of an afterthought. Breakfasts, lunches, dinners and snacks are thrown together or purchased at a restaurant with little thought regarding the nutrients contained in the products. Some researchers believe that this could lead to a big problem, especially for little learners. Wondering where to start? Check out our handy guide below for some ways to serve your son or daughter better food in order to increase his or her reading abilities. The first meal of the day is the most important for any person, but it's especially crucial for children. If your youngster's belly is rumbling, he or she is unlikely to care about the alphabet, phonics or whole word learning. Additionally, it's probable that over a few hours, sugar levels will drop and energy will decrease, leading to an even lower likelihood of literacy success. To combat this loss of brainpower, start your child off right by offering a breakfast that has a little fat and a lot of protein, fibre and carbohydrates. Have a picky eater? Then substitute "evening" foods like pasta and dinnertime meats for typical breakfast fare. Sugar is known for making children "hyper". (Though this has been disputed by some nutritionists and scientists, every parent has witnessed the "sugar rush" in action.) Sugar can also cause a "crash and burn" effect, essentially "revving" up a kid's system only to have his or her energy subsequently plummet. When a child is under such major energy swings, there's little chance for him or her to be able to give more than a few minutes to the act of reading. When all else fails, there's nothing wrong with relying on multivitamins to provide children with nourishment that they aren't getting from their food sources. Having vitamins in their growing systems will enable them to operate at peak capacity, essential for learning to read. Choose a multivitamin that's meant for kids, not adults, as each group's needs are different. If you're not certain which are the best for your child's age and ability, contact your family physician or local pharmacist for advice. If you're the type of parent or guardian who buys a great deal of "junk" food, it's time to curb your family's appetite for empty calories. Not only do these types of snack items pack on the pounds, but they can also cause lethargy. When a child is low on stamina, he or she will have difficulty concentrating on words and sentences. Even simple picture books could seem impossible to the young person who is tired as a result of inadequate nutrition. Because it can be tough to completely eliminate all junk foods from one's diet, make changes gradually and alter your own routine so your child doesn't feel "singled out." This can mean anything from replacing high-fat desserts with lower-fat alternatives to eliminating all store-bought crackers from your pantry. 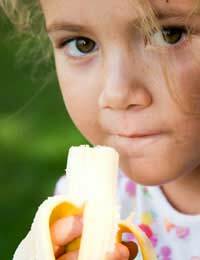 There's nothing wrong with telling your child you want him or her to eat healthly in order to boost brainpower. In fact, you'll probably discover that most kids love helping out. Not only will you begin to see a difference in your child's reading, but you'll also get a wonderful opportunity to bond with a very special person.